The mulled apple juice that I always do. For those that were drinking there was the offer of crab apple vodka to enliven it. I left out any ground spice, so it was just roasted apples, cardamom, star anise, cloves and a cinnamon stick, no mace or nutmeg, and it was much easier to serve with no grittiness. Then smoked mackerel pâté – essentially this BBC recipe but no horseradish and wholegrain instead of Dijon mustard, because that’s what was in the fridge. 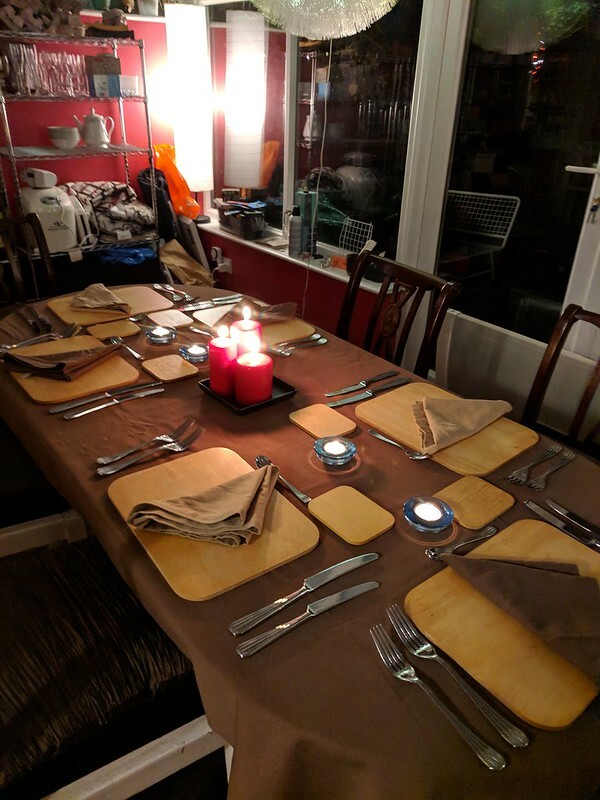 Served in espresso cups with oat cakes and crispbreads that were naturally gluten free, and with an antipasti jar of roasted peppers and some almond stuffed olives. 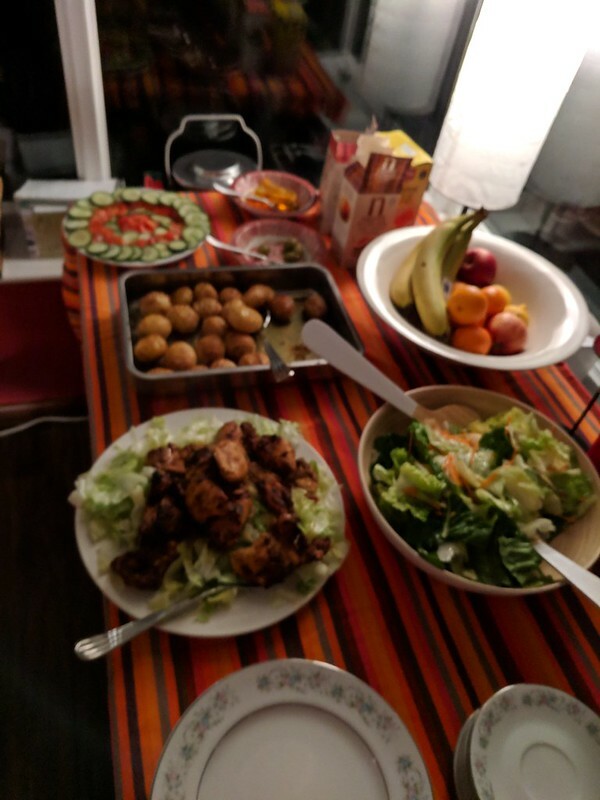 Nigella’s chicken shawarma, that I wrote about recently here. I forgot to buy yoghurt, although I went out of my way to get pomegranate seeds. I asked my guests to pick up yoghurt on their way and then forgot to do anything with it. Served with salad, cucumbers and tomatoes, and hasselback potatoes. 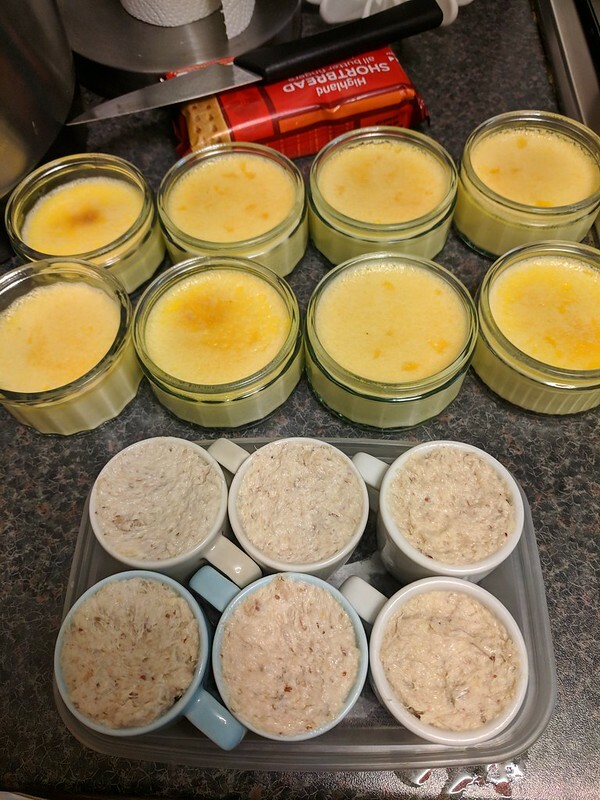 For pudding was vanilla crème brûlée – a trial run in the week had shown me that you need to leave them in the oven for almost double the time in the recipe to get a set custard rather than a liquid vanilla cream. A garnish of a slice of kiwi and a fanned strawberry – the strawberries were so unseasonal they crunched like carrots when sliced. This is a very simple thing to make, just four ingredients. The only faff is owning a blow torch. I brought them to the table and let my guests brûlée their own crème, which all seemed to enjoy. With coffee I made white chocolate salami again. This time it came out really well. Such a simple thing to make, looks really impressive. 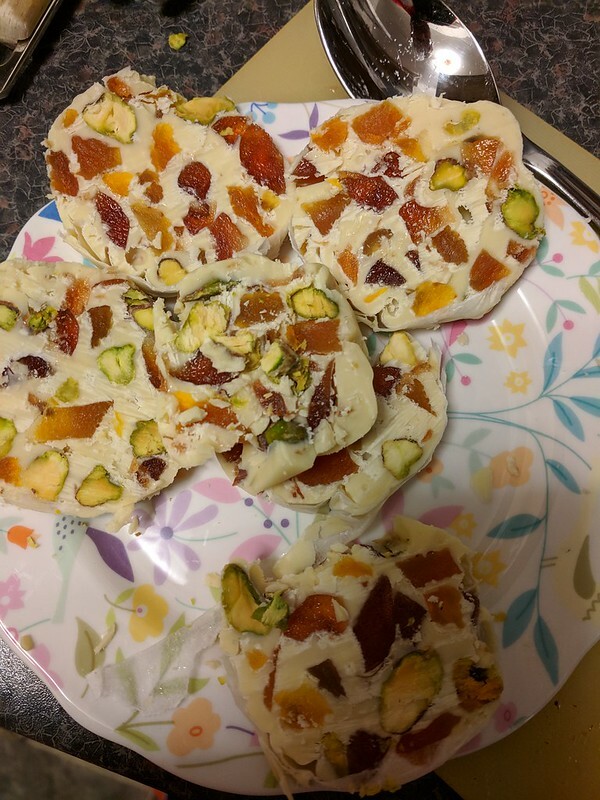 In it, I put a half a bag of shelled pistachios, some chopped glacé cherries and some chopped dried apricots.